CES 2015: Sharp to ship "world first" wireless high-res player | What Hi-Fi? It's been floating around for a while in prototype form, but now the Sharp SD-WH1000 has been confirmed for release in 2015 – letting you stream 24-bit high-resolution music and HD video wirelessly. Sharp revealed the wireless player back in June 2014, but the company seems more bullish here at CES 2015, that it's ready to ship. Not only about streaming high-resolution audio over your home network, it can also wirelessly transmit Full HD 1080p video to your TV. It seems the player is limited to 24-bit/96kHz audio, which it can receive from a NAS over wi-fi, a hard drive via USB or through a DAC. The SD-WH1000 works with WiSA-compliant wireless speakers or can be used with the Sharp VR-WR100U wireless bridge to connect to any audio set-up. Control comes in the form of the Sharp Mobile app, which is available for Android or iOS. 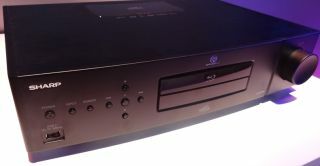 It will play "virtually everything in your media library" - physical or digital - with support for files including AIFF, ALAC, DSD, FLAC and WAV, as well as SACD and Blu-ray discs. In addition to wireless audio, the SD-WH1000 can "wirelessly transmit uncompressed Full HD 1080p video to your TV". There's no news on a UK release or pricing as yet, but it looks likely to cost $5000 upon its release in the US.